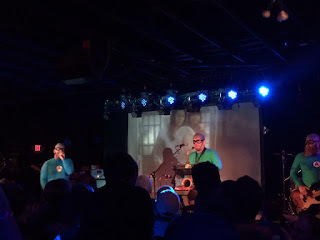 The Mosherpit: The Aquabats: Super Show! Last night something amazing happened. I got to fulfill a dream I had for a long time. I mean it wasn't a crazy and ambitious dream, but it was a fun one. What was it? Why, seeing the Aquabats perform live on stage at the Stone Pony (of Lightning). Who are the Aquabats? Why, only one of the raddest of the 3rd wave ska bands to hit the scene. They dress like superheroes, sing songs about science fiction and TV and pizza and put on a hell of a show. 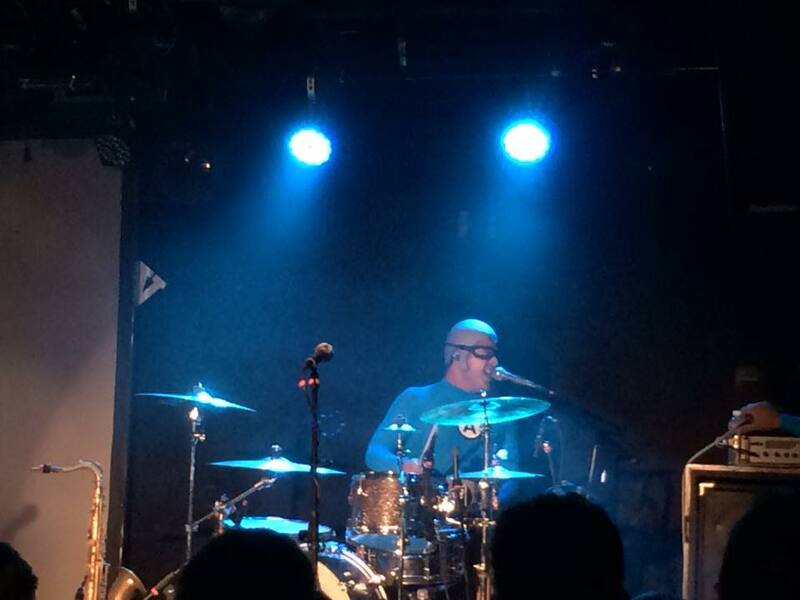 You might be familiar with them from their short-lived show on the Hub network--The Aquabats! Super Show! Their music is awesome and the show was just as cool as they are. They tour a decent amount, but it is mostly on the West Coast, so my chances to see them are limited. The times that they've been in the area, I've been unable to go due to commitments or being out of town. This time, however, I was able to make it work. Ricky Fitness singing "Your Love." Awesome cover. So how was it? In a word? Awesome. From start to end, the entire concert was great. 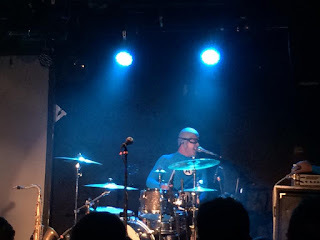 CJ Ramone (yes, of those Ramones) blasted through a wild set to start, playing quite a few of his namesakes songs and also some of his own that melted many a face. After him, Reggie and the Full Effect took the stage. I have to say I was unfamiliar with them, but they put on a hell of a show. When the lead singer comes out dressed like the Karate Kid and the band is in Cobra Kai outfits, you know that something special is afoot. The music was a great alt rock/punk sound that had me nodding my head and dancing. Plus he had a giant eagle come up on stage to hug him, so that was damn cool too. After another intermission and a quick PBR later, the band of my dreams finally took the stage. And boy did they do it in style. They even played The Aquabats! Super Show! theme to start. From that point on it was a set of hits old and new, from "The Cat with Two Heads" to "Super Rad" to "Shark Fighter" and more. Quite a bit of it was off Charge!! !, which is good, because it is one of my favorite albums of theirs after the first two albums. There were inflatables galore too. The band fought a giant inflatable Frankenstein's Monster who was also the new roadie. Beach balls were flying around in the air during "Pool Party," "Burger Rain" brought us burgers and "Pizza Day" brought us giant pizzas that two lucky kids got to crowd surf on after the Bat Commander hurled them onto them off of the stage. Yeah, it was that kind of show. Since they have an all ages appeal, there were quite a few families with their children there seeing the Aquabats for the first time as well. It was loud, but it looked like the kids had a blast, getting high fives from the band and getting to go up on stage and dance. It was a pretty bitching time if you were a child. Outside of being crushed in a sweaty mob, that is. Fortunately, they didn't allow moshing or crowdsurfing so there wasn't any chance of them getting too roughed up. The first encore was "Fashion Zombies" too, which had me super jazzed as I absolutely love that song. Then it was "Pool Party" and the show was done. So was it a good time? Hell yeah, it was a fantastic time. Even though it was a long day with work and then the show and rolling out of Asbury Park at almost 11pm and getting to bed even later and then waking up to go to work again, it was definitely worth it. I even scored some sweet shirts for my family and a poster to remember it all by. Can't wait to hang that up in the bar. 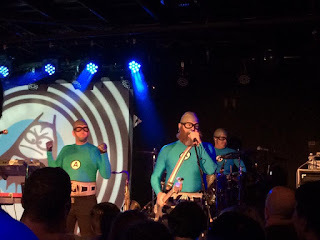 If you have a chance to check out The Aquabats live, do it. You won't be disappointed. Aquacadet Worsel of the Stone Pony of Lightning Chapter, signing off.